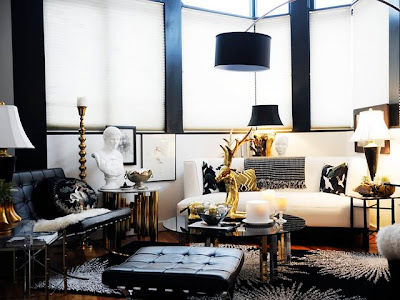 Love the stripey rug above, the white bamboo chairs, the head bust statue and the airy feeling. Ooh symmetry! I like most of this, especially the x-stools, rug and Greek key cushions. Symmetry (again), how I love thee. 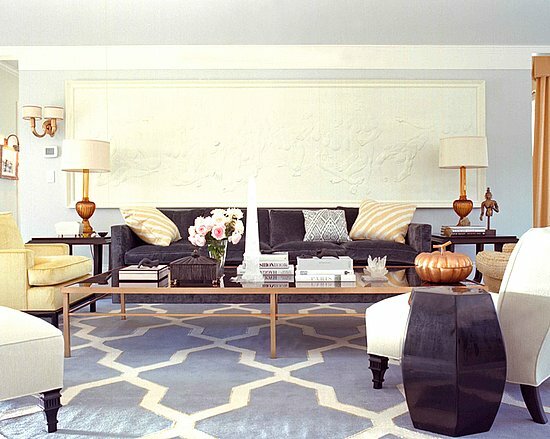 The trellis rug is what caught my eye in this design by Kelly Wearstler and I love the introduction of the yellow. The above is a little busy for my personal style - I only wish I could add so much interest without it looking messy and mismatched. 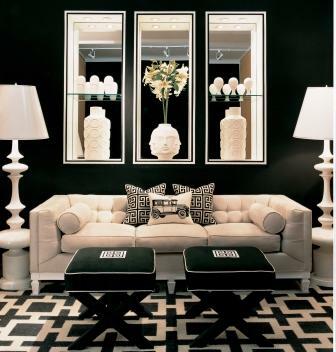 The black, Barcelona chair and ottoman manage to look cosy here. Is that a reindeer? Loving the antlers. Another bust. Love. I saved this image for the paint colour and carpet. Also love the illustrations, the sofa, the rug and the burst of pink from the blooms. Hunting and gathering for our own living room is now in full swing. I've tracked down some exciting pieces (an ottoman and trellis cushions to be revealed in later posts) but there's lots more to do. A fresh coat of white paint on the beadboard and a subtle grey to cover the green walls is on the agenda and new carpet too. Doubt over my initial choice of sisal has set in, so I'm looking for alternatives. The search for a replacement mantle continues. After getting some handy advice from Naomi of the Live Breathe Decor blog, I need to find time to paint four more black and white canvases to add to the two I did a few years back, track down an attractive fire screen to hide the ugly heater and have curtains made with some Greek key detailing. Did I mention I'm looking for a TV unit and side tables?! No time for my day job when I'm on the hunt for all the things that make my heart sing. Oh, hang on, that's how I finance this little adventure. Life! Carpets from Dubai are world-famous in lieu of their design & patterns. Special company of bungalow industry mirrors its import in Dubai carpet industry. Finest masterpieces & all types of designer carpets bear universal buyers. Fine carpet in UAE has about of most excellent showcases in Dubai. The excessive quality of these high-end carpets has universal fan foundation. When I grow up I want to be a writer, a baker, an interior designer, a fashion publicist, a Parisian and an all-round good friend, wife, daughter, sister and mother duck. I've started the journey and enjoy dabbling in all my loves. As the saying goes: Il n'est rien de reel que le reve et l'amour (Nothing is real but dreams and love). 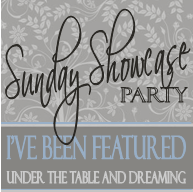 Read more about in the 'About me' tab.